Long Grove-Kildeer Garden Club Members Paula Van Singel (L) and Kathy Michas are two of many local ladies who serve as foster mothers to Monarch caterpillars in an effort to boost their dwindling numbers. My first summer job as a youngster was “walking beans,” which involved getting up at the crack of dawn and going up and down the rows of soybean fields near my central Illinois hometown, pulling out noxious weeds by hand. One of those undesirables was milkweed, and it wasn’t until I moved to Long Grove many years later that I learned of this native plant’s importance in our ecosystem. Yes, times have certainly changed, because this year I found myself actually planting milkweed in my garden on purpose–to attract the Monarchs. 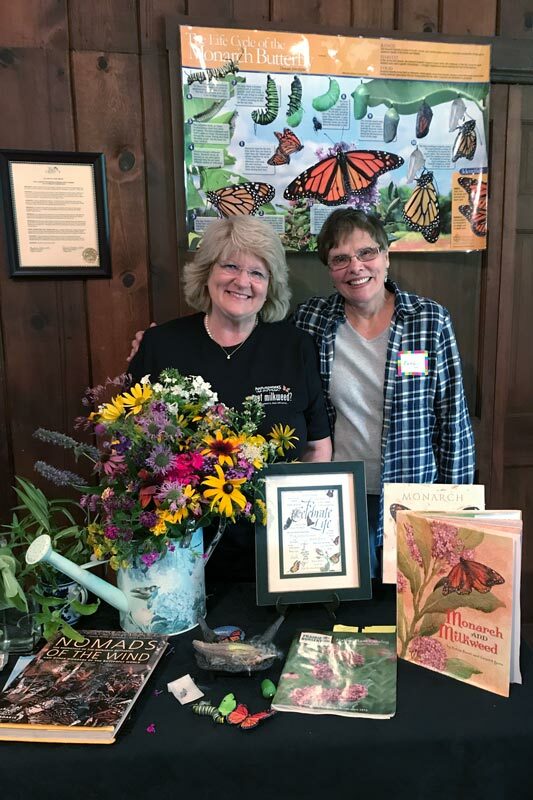 At the Long Grove-Kildeer Garden Club’s September meeting this past week, members Paula Van Singel and Kathy Michas gave a fascinating program on the plight of the Monarchs, and their efforts to help more of the species to survive here in Long Grove. Milkweed serves as the primary food source for Monarch butterflies, and they lay their eggs on the undersides of the plant’s leaves. Only 1 to 5% of the eggs laid in nature will survive, so Paula, Kathy, and fellow “Monarch Mommas” bring the eggs and milkweed plants indoors once they are discovered, to foster the development of the eggs into caterpillars. They are cared for in a special habitat and fed milkweed until a chrysalis is formed, and in about two weeks the butterfly will emerge and be released. Why do they do this? Recent studies have indicated that we have lost 90-93% of our Monarch population in North America in the last 20 years. According to Paula, her passion was sparked when she retired and started volunteering in the “Butterflies and Blooms” exhibit at the Chicago Botanic Gardens. Besides helping the species boost their declining numbers, Paula says she is further inspired because, “every time a chrysalis opens, my faith is renewed.” Every year at this time the Monarchs from Illinois migrate south to winter in Michoacán, Mexico, where they are losing their natural habitat. The forest in which they hibernate has dwindled from 45 acres in 1995 to 1.7 acres today. Their food source of milkweed has become more scarce due to the use of pesticides, and changing weather may also be playing a role. Did you know that the Monarch is our Illinois state insect? We can help the species to survive in Long Grove by planting more milkweed in our gardens and open spaces, and by being careful (or eliminating) the use of pesticides and insecticides on our property. Or if you really have a passion, you can follow the lead of ladies like Paula and Kathy and make an even bigger difference by fostering some “cats” next summer. You will have a front row seat to one of nature’s miracles!